I know within the last few months I have not been writing and posting weekly on The Crystal Avenue. Hence my guilty conscious got the best of me this past weekend, and with Spring quickly approaching, I thought it was now the perfect time to finally post “Denim Du Jour” for you since I shot this look almost two years ago today with Andrew and have been holding onto the look until the weather was appropriate again. Before I go into the outfit details, I am putting another disclaimer that currently my hair and skin tone are not the shade you see in “Denim Du Jour.” Maybe in the next few months I’ll revert back to a lighter shade for my hair. Only time will tell...for now. 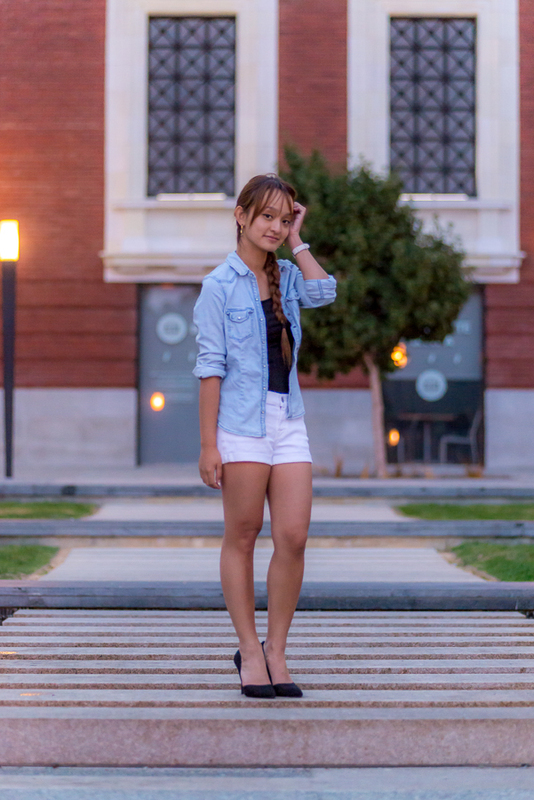 For “Denim Du Jour,” I wanted to style my soft washed denim shirt in a playful yet dressy manner for a girl’s day or night out, date, or a spring concert. Personally, styling denim or plaid shirts are not as effortless, because depending on if you decide to cuff the sleeves, tuck in or button up the denim shirt or not, the tone of the overall look changes. As I paired my denim shirt with my denim white shorts, I did not want the look to be engulfed in denim, if I buttoned my shirt. Thus I chose to leave my denim shirt unbuttoned, which then allowed me to color block my black cami and heels from Steve Madden. I also went with my Steve Madden heels to make the look less casual and more dressy. To finish off the look, I chose a pair of heart earrings and my Anne Klein watch to match my white denim shorts. I will see you again soon. If you are a basketball fan, good luck to your bracket and have an exciting March Madness. If not, I hope you have a wonderful rest of your week.